The HDMI extender over 1 coaxial cable is the right way to send your HDMI signal over long distances. Instead of using expensive HDMI cables, this device lets you use your existing coaxial cables/sockets while also performing the same functions like transferring Deep Color (12 bits/color) video, all with a bandwidth up to 225MHz. And if that weren't enough. 1. Compliant with HDMI 1.3, HDCP 1.1 standards. 2. Supports digital video formats in Deep Color Mode at up to 36 bits (12bits/color) and 48KHz LPCM Digital audio. 3. Equalizes and recovers incoming TMDS data before re-transmitting it in high quality, regardless of the incoming signal quality. 4. High Quality RG6 SDI cable can extend 100-meters (such as: Belden 1694A or Canare L-5CFB ); Normal standard 75-5 SDI Cable only extend about 50-meters. 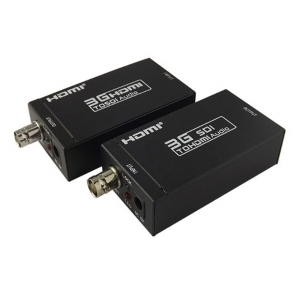 Connect the signal source such as Blu-Ray Player, Play Station 3, audio/video receiver, cable or satellite receivers equipped with HDMI output interfaces with a short high-speed HDMI cable to the HDMI Transmitter input. HDMI cable length should not exceed 16 ft.
Connect the HDMI Transmitter output BNC ports using single RG6 coaxial cables to included Receiver. It is strongly recommended that factory terminated cable assemblies be used and their length shall not exceed 328 ft respectively. 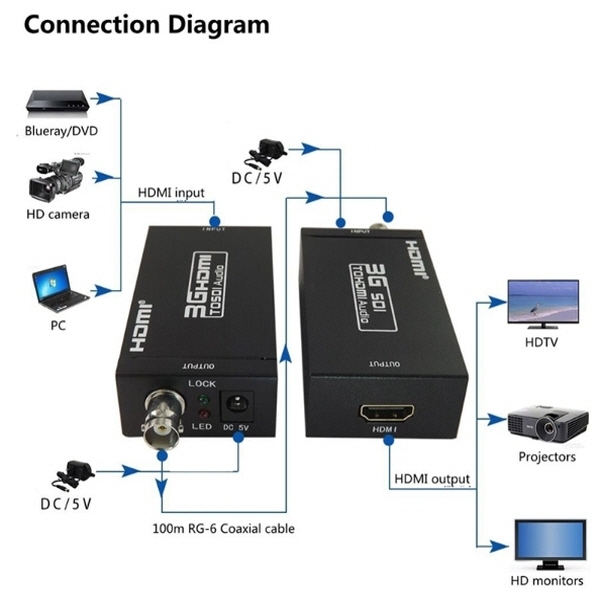 Connect the HDMI output from the Receiver to high-definition display devices such as HD-LCD, HD-DLP and HD projectors with HDMI input interfaces. Use high-speed HDMI cables that are recommended for the distances that are required for each connection. HDMI cable length should not exceed 16 ft.